A gin and tonic is a highball cocktail made with gin and tonic water, usually garnished with a slice of lemon or lime and served over ice. The amount of gin varies according to taste from 25% to 50%. Left: Gin and tonic with lime. This cocktail was introduced by the army of the British East India Company in India. Tonic water contains quinine, which was used to prevent malaria. Because the tonic water consumed to prevent malaria in the 18th century was extremely bitter, gin was added to make it more palatable. The bitter flavor of quinine complements the green notes of gin (flavored with juniper), much as dry vermouth complements the gin in a classic martini. Tonic water sold today contains less quinine and is consequently less bitter (and is sometimes sweetened). 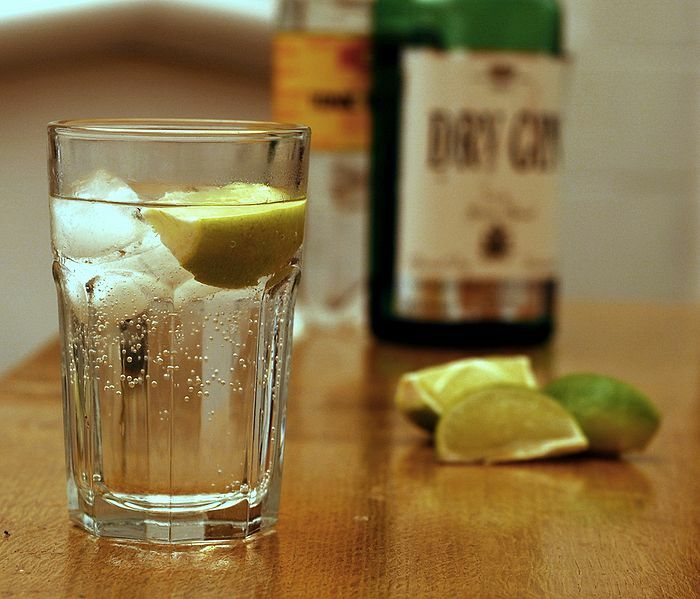 Although tonic water today has less medical use than formerly, gin and tonic has remained a popular drink. Because of its connection with warm climates and its refreshing effects, this cocktail is very popular during the warmer months. In some countries, gin and tonic is marketed pre-mixed in single-serving cans. In a glass filled with ice and a lime wedge, add gin and fill with tonic.